To view our available Transitional weavings, please click here. The early reservation life was a forced inflection point in the history of the Navajo. Everything had changed as trading posts were set up, and a new system of life began. The traditional life for the Navajo was forever gone. Resiliency and the ability to adapt are remarkable characteristics of the Navajo. Rebuilding their homes, crops, orchards and herds were all paramount to their very survival. The weavers had to deal with a new breed of sheep (Merino) yielding inferior wool, a new system of trade (i.e. through the trading posts), and worked with new "trade yarns" and dyes to work. Marketing their product through the local Indian Trading Post, weavers began the process of altering their weaving to the "white customer's tastes." Rugs for local ranch houses and for the tourists who were now coming "Out West" were in demand, not the traditional blankets. Rug making, of course, was a new idea in-of-itself to the Navajo, and it took time for the changes to be fully incorporated. This is the period of transition for the Navajo, and when we study blankets and rugs from this time, we refer to the period as "The Transitional Period" and the weavings as "Transitionals." During this time we often think of the earlier "Transitional" pieces, 1870-1880, as "Late Classics" instead of "Transitionals" if they carry on the dyes, yarns, and motif of the Classic Period blanket. But, if the item has fewer "Classic Elements," it may be more often be referred to as an "Early Transitional Blanket." In most cases, these early reservation pieces are blankets first and foremost and show few "rug" elements. By 1880, much of the weaving began to have rug elements: at first, the pieces were simply heavier and larger examples which looked like blankets, but were far too large and heavy to be used as such. 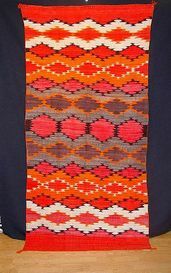 By 1890-1900 the design and patterns of the weavings also began to change; they went from the "blanket patterns" which were banded and open patterns to rug patterns, those which had distinct borders and large central motif. By 1900, few of the old banded wearing blankets were being made. The "transition" had more or less been made.